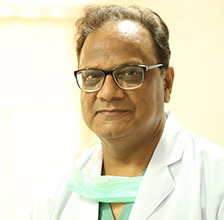 Dr. Sudhir Rawal is one of the leading Uro-Genital surgeons in India, with special interest in Robotic Surgery. He is having more than 30 years of experience in Genito Urinary Oncosurgery. He routinely performs procedures such as Radical Prostatectomy, Radical Cystectomy, Radical Hysterectomy, RPLND, and complex urinary diversion like continent pouch and neo bladder. "Pitcher's pot Ileal Neobladder" is one of his innovations which finds place in leading urology publications. He is first Uro Gyne surgical oncologist of North India and heading the department since the inception of Institute. He did first open Retropubic Radical Prostatectomy in private sector in India. Besides this he has done maximum number of Radical Prostatectomy, Radical Cystoprostatectomy Neobladder, Robotic VEIL, Robotic RPLND (Post Chemo) in country. First surgeon in India to perform Perineal Radical Prostatectomy. First surgeon in the world to perform Minilap Radical Cystoprostatectomy. First surgeon in Asia - Pacific to perform more than 1000 robotic surgeries in a short period of 4 years. Credited with the maximum number of robotic VEIL in the world. Credited with the start of multiple pioneer works in field of Uro-Genital Oncology and has trained many doctors in this field at the global level. Appreciation award Lupride Depot-Prostate Cancer Update, Vadodara 2005. National Convener, Uro-Oncology Urological Society of India. National Faculty in Ad Board Meeting on Sunitinib in Xain China. Best Paper award RGCON 2009, 8th International Conference. Designed Pitcher's pot Ileal Neobladder - International Journal. Organized the international conference on Uro- Oncology RGCON 2005. Mini laparotomy Radical Cystoprostatectomy with IlealNeobladder. Experience of Radical Cystectomy in Octogenarian (2009). Pioneer in HIFU in management of Carcinoma Prostate initiated at RGCI in March 2009.